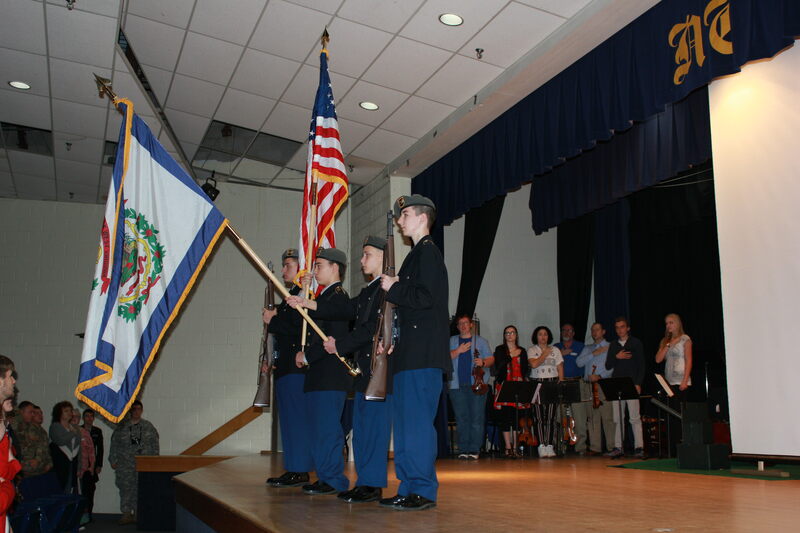 On Wednesday, October 31st, Nicholas County High School’s JROTC program, along with the band, art department, drama department, and other NCHS students conducted a presentation on patriotism. The program, entitled United We Stand, was to inform students about the history of the American flag and American traditions. It was also about uniting and getting the students to work together. It included a segment called “The Betsy Ross Play” which was directed by NCHS senior, Jacob Tallamy. Eleven veterans, two veterans’ spouses, and many people from all over came to NCHS to watch the presentation. On Monday, October 29th, JROTC welcomed a new Senior Army Instructor, Captain Habib. After only three days of being at NCHS and walking into a presentation that she didn’t know anything about, Captain Habib helped tremendously with organizing the presentation. “The presentation wouldn’t have been near as organized as it was without her,” Sergeant Long said. The cadets put a lot of time and work into the presentation; they started practicing for it in August, and started organizing it in September. Sergeant Long was proud of his cadets and pleased with the presentation. “I think it went good, but we’ll do it even better next year,” he said.